Last night was the Meridian Lions Club charter party. I was a little skeptical of a "Hawaiian" theme at an "Italian" restaurant, but they certainly pulled it off! With the Hawaiian shirts worn by many of the Meridian Lions, the leis, the table decorations, the hula dancers, the video of warm and tropical places, it didn't even seem incongruent that I was eating some great Italian food (and lots of it!) at Louie's. Great job, Lion President Loraine! Highlight of the evening was Bob Coates, 88-year old survivor of Pearl Harbor. His story of what happened to him that day in December as a 19-year old from Idaho had us enthralled. And did I mention Hula dancing? We learned it was best left to the professionals! 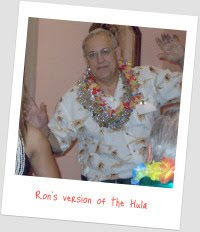 Here Ron Hagadone demonstrates his "dance moves". Or something.